At the top of the market, the kitchen becomes a status symbol which can cost anything, equipped perhaps with a range cooker, larger and more expensive than a Mercedes-Benz SLK car. How will the kitchen be used and by whom. What are the clients particular requirements, if any. While considering these requirements, remember that the basic layout of the kitchen may last considerably longer than the present occupiers of the house and, therefore, should not be so idiosyncratic as to devalue the property. For instance, although it is common knowledge that kitchens are frequently ripped out and revamped, the general disposition of the entrance door, main window, position of sink and cooker if needing a flue, will largely condition future layouts unless substantial re-building is undertaken.  How many people will the kitchen serve.  Or should there be a breakfast bar in the kitchen with a more extensive dining area nearby.  Is the person, who does most of the kitchen, tidy and able to work in a relatively compact area, or would they prefer a more generous layout.  Do the clients have a once-a-month massive shop, and therefore require a large area of food storage, or even a separate larder. 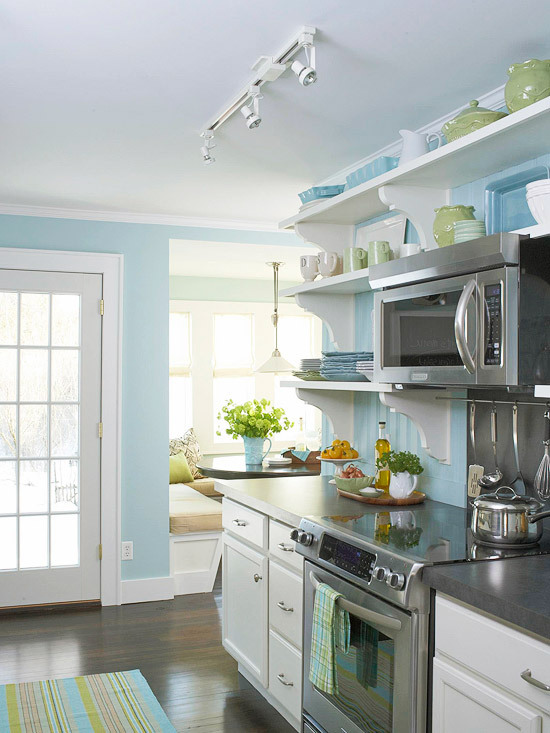 This gorgeous cottage kitchen wasn’t always this stylish and functional. With no room to cook, cramped counter space, its owners knew they needed to renovate the kitchen of their 1935 cottage in upstate New York. Kitchen remodeling in a down economy – part 2. In the next part of the series, I show you four more ideas to refresh your kitchen on a budget. Besides the countertop and the cabinets, the floor is the third element which determines the look of your kitchen. You need to be careful on floor choice though – kitchen floors need to be durable to resist to the tear and wear you will subject it to. If you don’t have a ton of money to spend, you can choose stone (again, local sourcing will help you), tiles or vinyl. If you like wood better, get laminate or engineered hardwood floor. Probably hardwood is better, as laminate does not really like water that much. Kitchen remodeling in a down economy – part 1. As house values are down across the board and loans / mortgages are harder to get, homeowners are finding few easy-money options for grand remodels. But hey, you probably should not do that anyway! Instead, why not go after projects that cost less, or even garner practical savings and keep their value much better when it comes time to sell. This is very true for kitchens: usually oneof the (if not THE) most expensive room in your home, a remodel can even cost anything upwards of $50.000 – which can be as much as 10% of the value of your home. Instead of spending a ton of money, let’s see a few options on modest, practical, recessionproof improvements that build a home’s long-term value while conserving energy or just allow you to rest and enjoy your kitchen. When you want to re-decorate your kitchen, first one tends to think the improvement of the kitchen in terms of big-ticket things such as new appliances, like replacing the old oven, a new refrigerator, or painting the walls, installing some extra cabinets (not always a good idea!) and more. However, we very rarely think changing the lighting of the kitchen – but it is an equally important feature! 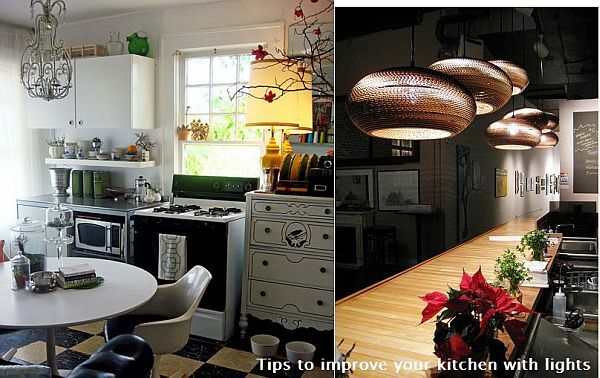 Lights can not just light up (ehmm..) your kitchen, but change the style, the mood, and even the colors! When talking about kitchen lighting, several factors come into play: lighting should properly illuminate the room, but it should not be so bright that it hurts the eyes. Kitchen lighting should be installed in a way than every corner receives optimal light, and work can be done without straining the eyes. Now that my kitchen is ready, it’s time to share a few things I’ve learned along the way… So, let’s see what I’ve heard from professionals as well as what are the things I’ve learned the hard way…. 1. I can add that easily later, no problem. Sure, but only if you leave space for that microwave, built-in coffee machine or whatever. Now there’s an issue: there will be a gaping void in your kitchen until you add the new piece of equipment. Sure, you can buy an extra cabinet door to cover it… But don’t forget, temporary solutions tend to become final ones – and as long as temporary things go, they are not the best. So look out. Designers say it’s best to add features to your new kitchen during, not after, renovation (or building). Even if you’re not sure whether you’ll use a something, prepare for its future installation by running cable and electrical lines. For example, one day, you, your growing kids, or a future homeowner may want a flat-screen television or a home-monitoring screen in the kitchen. Or, you may someday need more outlets on your counters and island. Be sure to have the right cables for electricity – that new washing machine or electric oven needs beefier cables than a hand-mixer..
2. I won’t have any clutter in my new kitchen. Yes, sure, you don’t need that extra storage, do you? I bet you do! I’m always short of storage and I bet you’re the same, except for that guy living in a warehouse. Sure, it’s not always good to have lots of stuff in a crowded pantry (and the things on the bottom of the heap won’t be used up ever) but always plan for more storage than you think you’ll need. You’ll be thankful to yourself at the end. 3. Bigger is always better. So the bigger the better, you think. If you just got that greeeeeat big kitchen, prepare for one thing: first you’ll be tired, next you’ll be fit. Because of all that walking, that is. 4. Yes, it will fit. I need it, you know. New flat, new kitchen. Finally, you can put all your dreams into it. All the things you’ve seen in magazines, that gorgeous island, that fine range and all bells and whistles. Don’t try to do what’s popular without any thought to whether it would work or not in the space… As opposed to the issues of a great spaces, there are issues with smaller ones as well – you need good organisation and keep an eye on not overstuffing it. Sorry, you cannot always have an island or that great L-shaped worktop. In smaller spaces it’s better to put in quality – in cabinets, appliances, design – you’ll especially appreciate a good designer helping you think through all aspects on how you best utilise the space you got. It’s tempting to follow the latest trends, but it’s better to be practical. Do you need that hi-gloss finish with your small kids? (how will it look like in a month’s time?) Will you still love antique cabinets in 10 years? Will that funny red-yellow kitchen featured in the magazine really work in your house? Always try to keep things – colors, materials, moods – in sync throughout your home – it feels so much better when you arrive. Don’t get carried away and plan before you do anything – remember, changing anything later will definitely cost more. So you want a brand new kitchen without the hassle and expense of remodeling? Why not give your kitchen a brand new look? A great way to do this is refacing your kitchen cabinets – at about third the cost of a new cabinet, refacing is a very affordable makeover for your kitchen. Besides this is maybe the less expensive option for remodeling your kitchen, cabinet refacing does have some unique advantages. It offers long-lasting results with only a small inconvenience, but you’ll still be able to choose from a number of cabinetry styles. Though it may cost slightly more than a $2,000 to $4,000 refinishing or repainting job, kitchen cabinet refacing is usually completed in a few days and won’t leave all those chemical smells.If you are looking to fix up your kitchen within a tight budget and want to spend your home improvement dollars the most wisely, cabinet refacing could be the perfect solution for you. Woody Allen said once: “Money talks. All mine says: goodbye!” Funny it is for sure, but believe me, you don’t want to tell things like this. After you’ve spent hours paging through design magazines, imagining every aspect of your dream kitchen, it’s time for a reality check: the budget. Sure, it’s not as fun as contemplating countertop choices, but giving careful consideration to budgeting can keep a project from turning into a nightmare.